Putting on campfire skits is just one great way to keep the whole family entertained during a camping trip. Precede the skits with a fun meal cooked on the campfire and top off the evening by making s'mores and you've successfully filled the entire evening with fun-filled activities. As a parent, you shouldn't go to too much trouble in organizing the theatrical ventures around the campfire. Kids will have more fun if they come up with the majority of the ideas for the campfire skits themselves. Not only should you give them the space to develop their own story line, but also encourage them to come up with any costumes or props themselves and to be responsible for setting up where the audience should be. If you have a few children in your family, or you've brought along some of your children's friends, you can really let the kids plan and prepare the campfire skits themselves. Stay nearby so that if real arguments break out between the children you can step in; nothing will ruin the planning process quicker than having a group of children who can't cooperate on preparing the skit together. Not only is the skit time itself a fun activity for the whole family, but the kids can also have lots of fun preparing their skits during the day. If you've had an active morning, an afternoon of script-writing and costume-making can be a nice calm change to prevent the kids (and you) from becoming extremely overtired. One aspect of the planning that you'll probably have to help the kids out with is coming up with the idea for the skit. While campfire skits can be about absolutely anything, most kids will need a nudge in order to get started creating their skit. Once you give them a few ideas, they will usually be able to take it from there. Often, you won't recognize the original idea for the campfire skit when you see the final version of the skit performed. Most times, children will really let their creativity guide the skit creation process, but coming up with an initial idea can be extremely difficult. Narrate a Ghost Story: Let one person be the narrator, telling a ghost story, and let the other children act it out. Older children often love this option, while younger children should probably not try this one because of the likelihood of staying awake all night with nightmares. Act out a Favorite Story: Younger children enjoy acting out their favorite stories, whether these stories have children or animals as their main characters. Act out History: Children just starting to hear about major historical events enjoy acting them out; for example, suggest acting out Columbus' voyage or Paul Revere's ride. Celebrity Drama: This is another good option for older children who are becoming aware of celebrity life and television stars. If your kids know celebrity stories, they can act these out, but even if they don't know what's going on with celebrities, many pre-teens will love making up their own version of what's going on in Britney Spears' life. 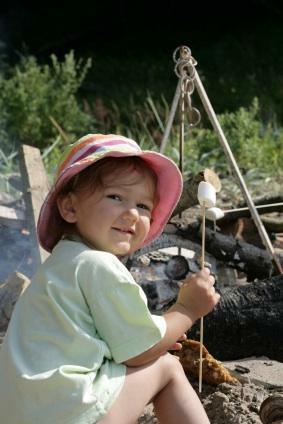 Campfire skits are just one suggestion for fun activities for camping with children. Making s'mores or popping popcorn over the campfire are also loads of fun, but if every evening centers around junk food, it's hard to imagine that swimming and all that fresh air are having as much positive effect as they could. Theatrical ventures are one way to fill an evening while camping; another good way is to involve your kids in cooking dinner by using some kids camping recipes for your dinner selections. Try to keep it healthier than hot dogs on sticks every night, but do realize that hot dogs and s'mores are just as essential to any camping trip as a campfire and ghost stories are!